This photomicrograph shows a cytochrome C oxidase stain of skeletal muscle. In normal muscle, which of the following statements is true about the fibers that stain DARKER with cytochrome C oxidase? Cytochrome C oxidase is a marker of mitochondrial activity. 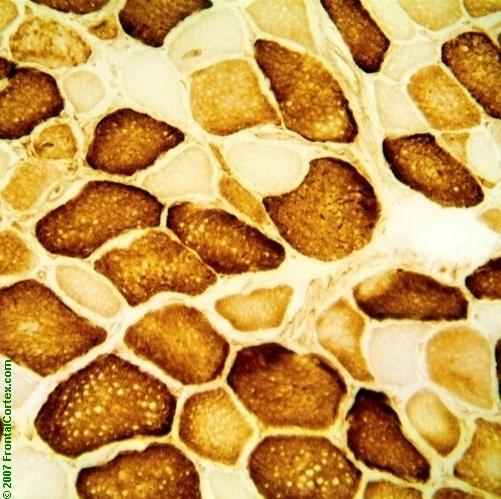 In normal muscle, type 1 fibers stain darker than type 2 fibers with this type of stain. Type 1 fibers tend to contract more slowly. They are more fatigue resistant, and have a more oxidative metabolism than type 2 fibers.